In the context of Western political science, the developments in Russia and China over the last twenty years are very hard to understand and may be regarded as ‘anomalies’, if one does not provide a proper historical background to today’s situation. 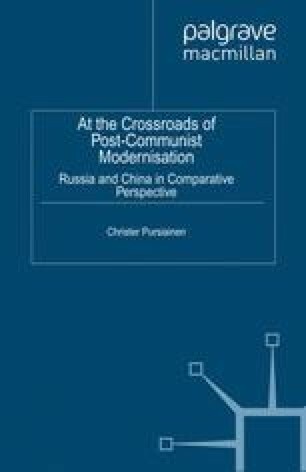 While there are naturally several interpretations, it is argued here that historically these countries’ domestic modernisation strategies are, to a considerable degree, shaped by pressure created by the developments in Western capitalism and the connected great power politics. Russia and China were forced to adopt modernisation strategies in order to adapt to - or even survive the pressure of - the ever-enlarging, Western-dominated global capit-alism. Even the communist periods of these countries can be seen as a defensive reaction to this global pressure. At the same time, the current developments in Russia and China can be understood as efforts to adapt to the developments of Western global capitalism and to change the direction of global development into one that would better match the perceived Russian and Chinese national interests and identities.